Offering you a complete choice of products which include plied, folded yarns. 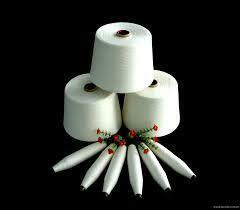 We are the exporter of Folded, plied yarns produced on two for one (TFO) twisters . These yarns are used for knitting as well as weaving and sewing . These are also used for Rugs and Carpets . It comprises spun yarns like 100% spun polyester , 100% Viscose , 100% cotton , 100% acrylic yarns , and the blended like Polyester:cotton, Polyester/Viscose etc . The number of plies possible is till 9 plies.